This is a story about balls. Not any old balls you understand. Big balls, special balls. These balls are so shiny you could use them to signal SOS from a desert island. These balls my friends are chrome balls. I see that perplexed expression on your face. I see the frown. I see the lack of understanding. Well let me be your Mr Miyagi. Let me be your Yoda. Perhaps I can be your guru in enlightening you as to what manner of man such a fine pair of balls belong to. There is only one man who could wield such a fine pair of perfect spheres. Who you cry, who can it possibly be? You are guessing now I can hear you. What dude or hero you are musing could possibly have such pristine artefacts? Is it perhaps Indiana Jones? Is it Batman? Is it Captain America? Doc Savage? Perhaps it is Roland Deschain? Maybe just maybe it is Iron Man or the Cape. A hint you say? You want a hint? Well okay I’ll give you a hint. If I tell you they are Bocce balls is the mist clearing? Yes, I see that you are nodding. That’s right it’s the man for the moment. He is stepping up even now drawing himself up to full height. His shadow cast long and large across the beach. Let the unjust quiver in fear. Let the cheats and low lives run from his long arm. That’s right folks the man now stepping into the richly deserved spotlight is none other than Giovanni “G-Man” Gelati. Marvel at his chrome balls. Holy Chrome Balls On Fire! 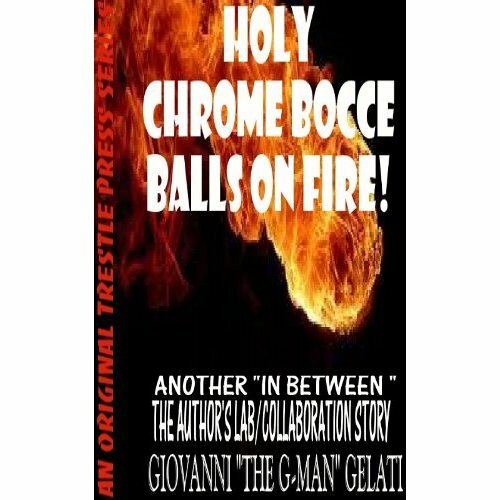 Is the next instalment in Gelati’s series of stories set in the intensely competitive sporting world of Bocce tournaments. Expect puns and humour but most of all expect fun. Will the Russians win? How about the Chinese? Will our boys from USA in their tournament uniform of Hawaiian shirts do it for the USA? What would you do if your balls caught fire? Find out all this and more in the latest thrilling instalment of the chrome balls series.